Trinamic (Germany) has launched the Pandrive PD42-x-1670 device series. The product comprises a stepper-motor with integrated Hall sensor. 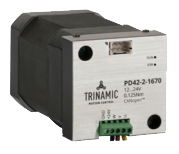 The product family features Trinamic’s first smart motor solution with brushless DC motors. The 42-mm flange-size motors have an integrated Hall sensor for closed-loop FOC-based operation. The drives are designed for 4000 rotations per minute nominal velocity and a 6,25-Ncm to 18,5-Ncm rated holding torque. Suitable for laboratory automation, machine control, robotics, and CNC applications, the drives come with two CAN-based communication options: CANopen (CiA 402) or TMCL, a proprietary higher-layer protocol. Parameters can be permanently stored on the board itself and the drive takes care of all time-critical operations such as ramp calculations itself, ensuring low CAN busload. The mechatronic solution includes state-of-the-art field-oriented motor control and power driver circuitry. A Hall-based rotary feedback system makes it reliable and durable. The drive is designed to work with a 24-V power supply. Available from March through Trinamic’s distribution channels, the products come in three different lengths, each having 42-mm flange-size brushless motors.